You will park on the gravel in front of the garage, where the silver trailer is in this photo. Please back to within 10 feet of the garage (right behind the trailer, not visible in this picture). It is OK if you are longer and extend in front of the house. I am on a private dead-end dirt road, right at the base of a mountain, just east of Columbia Falls, MT. Peaceful wooded environment, horses next door. Enjoy the sound of the wind in the treetops, and the birds. Take a walk and dangle your feet off the foot bridge, into the creek. WIFI is available at the house, you are welcome to come sit on the porch and surf. Water to fill is available, it is delicious Montana well water. It is not close to a particularly flat place to park so a water fill is available, a water hook-up is not. I am able to host 1 RV or trailer with easy access, and have had rigs from 10-40 feet there. That spot has access to 15 amp power. I can host additional short rigs, under about 22 feet, with true boondocking. Also, I travel a lot on a somewhat random schedule, and often my calendar is out of date for when I am here, so feel free to ask, even if it looks like I am not available. No smoking anywhere on the property please. During the summer this area often has active fire restrictions. Please check with me before using the fire pit, to make sure we are not under county fire restrictions during your visit. Friendly dogs (friendly both towards people and other dogs) are welcome. They may be off leash on site. I have a very friendly dog who will spend all day trying to get your dog to play with him. Do not park on the grass. Please only park on the gravel. This is on a private dirt road. The tightest turn is into the driveway. The largest rig I have had in was a 40 foot class A, and I have also had a 37 foot bumper pull. They made it in the driveway without trouble. The branches along the driveway coming in are a bit low, however they are small. For the best parking with 15 amp power, hang left when the driveway splits, and then at the top of the circle, straighten out and back a short distance to the garage. I do not have water available to hook up, however you are welcome to fill tanks with delicious well water on your way in. I am in and out a lot. I usually have my availability calendar updated, and it never hurts to ask. Glacier National Park, home of Going to the Sun road, is about 20 minutes away. There are several attractions along the river, including rafting, and helicopter tours. We also have Big Mountain ski area (now known as Whitefish Mountain Resort), along with the tourist towns of Whitefish and Bigfork. Bigfork is home of the Wild Mile, a kayak race down the river. There are also lots of hiking, and snowmobiling opportunities. We had a very enjoyable stay our Hostess was very informative about what to visit where to go what to see as well as being very hospitable. Wendy is an awesome host and Pinesong is a great location. Very convenient to visit Glacier and Whitefish. Would love to visit again. StormRunner is a fantastic host. She is an old friend that I just met. After setting up, she invited me to dinner with a friend the following evening in her home. We also attended an outside concert in town and went to a local annual Horse Show that benefits cancer research during my stay. Wendy offered to let me stay additional days as I was scheduled to move to another local Boondockers spot. We had two additional Boondocker families stay one night and the bonfire was on. Marshmallows were a great hit! As I said..... fantastic host! Awesome gathering of people and a gracious host. Stopped at this postcard perfect bit of heaven complete with a forest, river, fellow boon dockers and a couple of friendly dogs. A highlight of our trip was the ceremonial campfire, complete with an ever burning log. The host was so welcoming and made us feel right at home. We would have loved to spend more time there...hope to see her again. What a wonderful host and experience! Learned a lot, shared a campfire, and looking forward to our next rendezvous. Storm Runner is amazing and her property is absolutely beautiful. Our kiddos adored her two Belgian Shepherds. We loved chatting over wine and wished we could have stayed longer (as she offered) but we have to keep traveling. We hope to see Wendy again in her travels or ours. Amazing Location, and Gracious Host! StormRunner was a very gracious host! She was very patient with our flexing schedule, and she allowed us to fill our fresh water tank and plug in to her 110 electric. The site was absolutely beautiful, peaceful, and private. Bring your mosquito repellant (but that is true anywhere in the area!)! 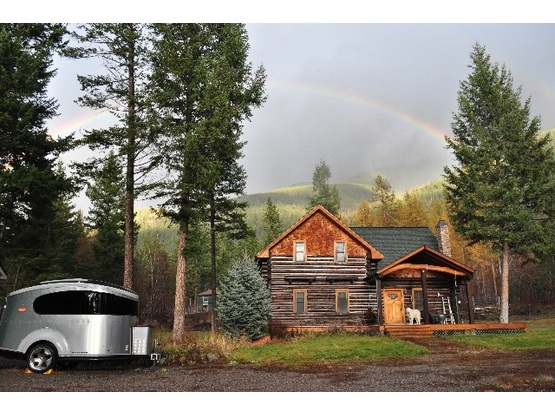 We would definitely recommend staying with StormRunner while in the Glacier National Park area! We so enjoyed our stay with at StormRunner's Pinesong. Her property is secured with a coded gate and it is oh-so-quiet and peaceful. We were able to park our 37' travel trailer without difficulty - she has a lot of "wiggle room" for parking. We hope StormRunner will come south for the winter and stay with us a few days. Thank you for the restful stay in such beautiful surroundings. Beautfiul days in Cordial Falls! We spent great days at Wendy's house. She was really welcoming and kind. Her house is really convenient ir you are planning to visit the park. We had a great time staying with Wendy. She is a very interesting and fun person. We felt like we were actually staying with family because that is the way she makes you feel. Highly recommend her as a place to stay for a short term visit to the area. Very informative on things in the area. Fantastic lady, highly recommend her as a boondocker stopover. Great location to use as a base to explore Glacier National Park! We stayed for a few days and got to explore the park as well as Columbia Falls. It was such a relaxing and quiet place for us to take a break and catch up with planning during the few days of rain we had. The rain we had was snow in the park and looked beautiful with a line of snow covering the tops of the mountains. Would love to stay here again with better weather to explore Glacier more but who knows maybe in the future! As our first boondocking experience, we had the joy of meeting an awesome and most accommodating host, StormRunner! We enjoyed getting to know her and experiencing the warm and friendly Montana hospitality. She provided a beautiful campsite with 30 amp hookup and the best tasting well water ever. Her property backs up to the mountains and has a gorgeous creek running through it. Within 5 minutes of the property is a gas station with a RV dump. 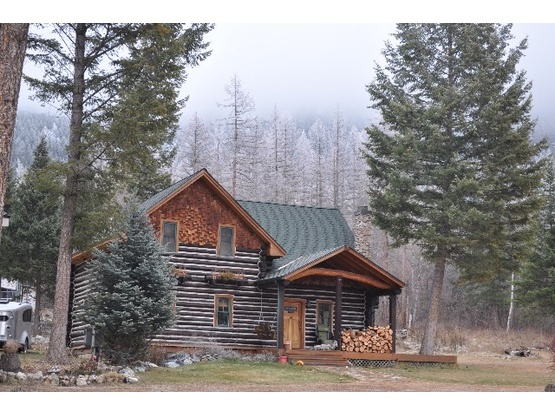 Her property is a few minutes from the charming town of Columbia Falls. In town, across from the grocery store is a really nice and clean laundry mat. I won't go into details but StormRunner went way above and beyond in helping us out with some travel emergencies. We would highly recommend StormRunner and would definitely stay there again. We could never thank her enough! 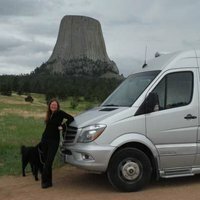 We enjoyed two days boondocking at Stormrunner's ranch and are grateful she was in town. We met Storm and Ellie, Belgian shepherds who are friendly and curious. Had a great hike on the hills above the ranch. We dried our hand washed laundry in the warm sun. A delightful respite in our travels. We were fortunate to stay with Stormrunner again this year. Her place is very secure and we always feel welcome. Location not too far from Glacier National Park. I can highly recommend this location. We really enjoyed staying with Stormrunner on her property. We had a nice chat on the front porch of her cute log cabin, after we got settled in. She was nice enough to let us stay, even though she was getting ready for her own trip. We had just visited Glacier national park and it was nice not to have to drive too far for a place to stay. Thanks again, Stormrunner for your hospitality and please come visit us in Michigan on your travels! Even with our late arrival she was still there to meet us. Her place was perfect for our truck and camper. We stayed two nights here, and had a great stay. Easy ride to both Glacier and the towns of whitefish/kalispell/etc. It is nice and quiet there and it wasn't hard to find. Would recommend this place to others! Thanks again for having us! The host was very gracious and fun to be around. She went above and beyond, cooking us dinner one night and inviting us for a game of pool as well. The property is great and we were greeted by friendly goats and excited pups! We stayed with her during our visit to Glacier National Park, which is not too far from her property. We had a great time exploring the area and having a safe place to come back to at night! Traveling from Jasper and Banff in Canada, to Glacier National Park, on to Yellowstone and the Grand Tetons, this spot was perfectly located, and provided the things I needed: quiet, water, electric, and a pooch to love on. The host is friendly, flexible and generous, and very welcoming. I stayed through a storm and was comfortable. Could not have been more accomodating! Wendy did all she could to make sure we had a wonderful night at her lovely home. From being greeted by her friendly goats to providing us with more than we needed - StormRunner is a 5 star host. We stayed with Stormrunner during our visit to Glacier National Park. The location is private, secure, and lovely. Storm runner was a gracious host along with Storm, the search dog. I only have positive compliments for this host. Dinner, wine, good conversation, quiet surroundings, plus use of indoor plumbing. Who could ask for more? We had a great visit and hope to see StormRunner again. We thoroughly enjoyed our stay with StormRunner, who was an absolute delight to be with. This host has 9 other reviews.